​That Bountiful Harvest You've Dreamed Of Will Be A Reality, Right In Your Own Backyard! 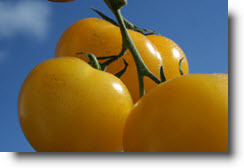 ​Are you fed up with paying top dollar for bland, mass-produced, poor quality tomatoes? If you want only the best tomatoes for you and your family, then this will be the most important letter you'll read all year. For decades I've been mastering my tomato garden... troubleshooting problems, surviving and fixing my mistakes, and learning all that I can from every avenue I encounter. I figured that after all those years of trial and error that I'd finally reached my goal and perfected my tomato growing, but something was missing. I still didn't feel fulfilled. Now I'm certain that this journey hasn't ended. It would not only be foolish, but selfish to take these years of experience to the grave with me. I know how great it is to bite into a tasty tomato, especially knowing exactly where it came from. Not to mention, you deserve the best. Surely you want to treat your body right and to provide your family with only the finest. Now, you can be certain that you will be putting only the crème de la crème of tomatoes into your favorite recipes... and the supermarket won't be robbing your wallet of that precious green you need to survive in today's struggling economy. With the help I'm offering you, growing loads of succulent tomatoes will prove to be quite simple. There won't be anymore guesswork. You'll have all the information you'll need to guarantee the success of your tomato garden. ​You're going to learn what to look for, what to do, and how to do it. ​So Why Is This So Important? ​Because today I'm offering you a book that will shed all the light you'll need on what it takes to experience ultimate success in the art of growing tomatoes. I say art, because that's how I've molded tomato growing into my life. I've turned the practice of tomato growing into something more than just gardening. ​These are just a couple of common problems that many gardeners have and among many others that are thoroughly discussed in this must-have eBook. ​So how do you know what to do? How do you recognize and prevent problems with your tomato garden? And if it's too late to prevent, how can you fix it? ​These are just a few of the questions that will be answered! It is the golden rule book of tomato growing, with knowledge that's been compiled from decades of experience, from select master gardener's sharing priceless knowledge (the ones who shared the same ideas as far as spreading the organic way of gardening around the world), and from much trial and error. You will now have the pleasure of skipping over embarrassing and devastating faux pas. Not only did I have the honor of learning from many master gardeners, I couldn't have done it without the many wonderful childhood memories of helping out with my grandparents' garden. In their childhood, growing your own vegatables was just how things were done, so it was only natural for them to continue that lifestyle throughout their adult lives. For that, I have much gratitude since I took part in planting, tending, harvesting and even canning their garden vegetables with them. Way back when, as a novice gardener, I endured a lot of trial and error. ​OOPS! WATERED ALL MY LEAVES IN THE HOT AFTERNOON SUN! ​Just two of the big no-no's that had me frustrated. Well, I lived, learned, and didn't make the same mistake twice. Just like life, tomato growing wasn't any different. I've made growing my own vegetable garden a priority, a necessity. It's become second nature for me and I believe that the knowledge I've accumulated throughout the years really doesn't do me much good anymore unless I can pass it on to those who share this common interest. I'm offering you a must-have package of valuable information that most gardeners would prefer I kept secret. This stuff is golden. It's what keeps successful tomato growers all over the world growing the best tomatoes possible. Even though I'd seen their awesome gardens and tasted their luscious tomatoes, I had to test their advice out for myself. Just to make sure they weren't sabotaging me (ha-ha). And, they weren't. I was as​tounded at how accurate their tips were. Now that you'll have this invaluable information at your fingertips, you'll have nothing left to worry about when it comes to growing tomatoes. You’ll discover savory new tomato dishes that will impress your family, guests, even impress your own taste buds. You’ll see why it’s so important to eat organically, and the best way to ensure that you are is by growing your own fruits and vegetables. Now you’ll know exactly what you’re putting into your body (and feeding your family, friends and neighbors). Discover what gardening can and will do for your emotional state… how gardening can help you escape from everyday stress. Know what your plants need for not just adequate nourishment, but for extreme nourishment. The more you nurture them, the more they’ll nurture you. Identify diseases on foliage and fruit so that you can properly manage the situation…(you’ll have the upper hand if you just follow the guidelines for choosing varieties that are trouble-free). Learn techniques to eliminate troublesome insects and pesky pests (don’t let your garden be the local rodent’s smorgasbord). Learn how to stake your plants properly so you don’t risk destroying their roots. Know how to water your tomato plants so you don’t end up with blossom end rot, fungus, or soil borne diseases. Get helpful tips on how to safely preserve your tomatoes so they’ll last year round. Learn how to save seeds from your favorite tomato plants. They aren’t the easiest seeds to gather but when you find a tomato plant you had great success with, or a tomato that was “to die for”, then you want to make sure you can reproduce them next season. 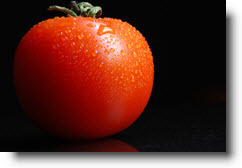 Discover fun tomato facts that you never knew about. You’ll impress everyone with these little tidbits of knowledge. Get great ideas on starting a garden journal. This will be a great reference for you in your years of future tomato gardening. You’ll see how to get some great therapy and ways to share this experience with your family. How to Not get faked out by the competition - Like any good poker player, they might not be showing you their whole hand. I truly wish I had a book like this years ago before my tomato growing adventure started. As I'm sure you've noticed, this audio and transcript is packed with information to help you choose the right market today. If that's not worth the price of a value meal at your local restaurant, then I don't know what is. My eyes were opened when it came to the emptiness I still felt as far as growing my tomato garden was concerned. This last summer I had an unexpected experience that brought such joy to my heart that I decided I needed to share my tomato growing expertise with others who can and will appreciate it. That’s when this eBook idea was born, and I recognized it as the missing piece to the puzzle. Last year my girls and I went to visit my sister and her family out of state. We brought some of our scrumptious homegrown garden goodies with us. Her family was pretty excited that we brought them… almost as excited as they were to see us. I didn’t know this when I packed, but her family had been participating in a local co-op, so every week they’d go pick up their organic veggies. Unfortunately, they weren’t always impressed with their weekly take home. Her family is extremely health conscious, watching every little thing that they eat and making sure the kids aren’t eating any artificial ingredients of any sort, so to be able to bring them some of my garden winnings felt great. My sister tried a bite of one of my tomatoes and she was amazed. She said it was the tastiest tomato she’d ever had and couldn’t wait for her husband to come home and try one. I didn’t realize what a hit they’d be, so sadly I didn’t bring nearly enough to satisfy the demand (though I could’ve). Her husband barely made it in the door from his 9 hour office day before my sister had rushed him into the kitchen, insisting that he try a bite of this tasty organic morsel. It felt great… I couldn’t believe how much pride I felt, getting praise for growing the best tasting tomatoes they’d ever had. And here, they’d been paying good money to participate in the local organic co-op. I felt a little bad, noticing their disappointment in what they’d been getting from the co-op. I hadn’t brought them to show off, just to share. That was the moment when I truly grasped what I’d accomplished, as far as mastering tomato growing. For me it was an art instead of a science. Science doesn’t have feelings… art does… and I have feelings attached to what I grow. How could I not share this with the world? This is what I hope for you, and am sure you’ll succeed. ​Worries about your garden will be a thing of the past! Not only will the worries be removed, but your tomato garden will be full of scrumptious tomatoes. PLUS… you will be getting (if you take advantage of the opportunity) plenty of physical and mental exercise. Gardening has been a tremendous therapy for me. When I’m working… (well really playing)… in my garden, my problems melt away. I don’t have to dwell on any hardships or negativity that the day has confronted me with. I can let it go, and focus on my garden. I focus on nurturing my plants; giving them the TLC they need to thrive. This book makes growing tomatoes very simple. It minimizes mandatory time spent in the garden, allowing for more relaxing time in the garden or anywhere else for that matter. The chore of pulling weeds (part of my garden therapy), for instance, might actually be eliminated (though it’s one of the most therapeutic garden activities I enjoy, even though there aren’t many weeds left to pull). However, weed pulling is replaced with preventive measures, which are also very healing on a hectic day. Just spending a little time every evening, checking on your garden’s progress, meditating in your garden or talking to your plants, can release a ton of stress. If you haven’t already practiced this regularly, you may amaze yourself. As far as these simple yet necessary garden secrets go, you are guaranteed to be satisfied with what they’ll do for your tomato production. Many gardeners like keeping these tricks of the trade a secret, giving them the upper hand when it comes to growing the best tomato crops possible. Now, you can learn them all. And what’s so great is the journey. Your final outcome will be magnificent, but like life, it’s also about the road that gets you there, and what you choose to make out of your own personal gardening experience. You don’t have to dream about that perfect tomato garden anymore. With this eBook available for your reference, you’ll have the all the knowledge you’ll need to give you the confidence for success. This is written with only the best intentions and to offer you the best experience you could possibly have growing your own organic homegrown tomatoes. The great part about this offer is that you risk absolutely nothing when purchasing this eBook. I am so certain that you will succeed that if anytime in the next 60 days I will give you your money back if you aren’t completely 100% satisfied. 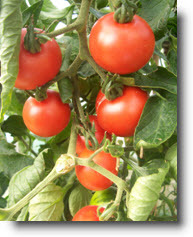 This eBook full of all the knowledge you need to grow the best tomatoes in the world is valued at $49.95. But I know how tough times are right now and I want you to succeed, so for a very limited time I’m offering it to you for just $29.95. But hold on… that’s not all! When you order now, you’ll get this special bonus gift, from me to you. Not only will you get all the fabulous facts in this book, 100% risk-free, I want to share with you outstanding low-budget gardening secrets. In today’s struggling economy, a penny saved is a penny gained. These great secrets are going to save you money where you didn’t think possible. You can still play in all your garden without going broke. Don’t worry about breaking your piggy bank to keep your garden up with the Jones’. These fabulous money saving secrets will have blow you away. These secrets are valued at $19.95, but with today’s economic stress, they’re yours, FREE! It wouldn’t make sense to sell you ways to save, would it? Not in today’s economy! So what are you waiting for? Start growing the tastiest tomatoes on the planet, NOW! Order now while this letter is right in front of your eyes. It would be a shame to pass up this awesome deal. The results you get from simply ordering this book will amaze you, not to mention everyone else who has the privilege of tasting your scrumptious tomatoes! Don’t let this offer pass you by. Time is of the essence! You Have Nothing To Lose… Just Tons Of Tomatoes To Gain! You will be taken directly to the download page the moment you order. The transcript is in PDF format and is easily printable for your convenience. Your order is processed by ClickBank... so you know it's secure. My site never even has contact with your credit card information. That's all handled by ClickBank. If it isn't the breakthrough you need for your Tomatoes, simply request a refund. No hassles. No problems. And you get to keep all the materials for your trouble! All You Have to Do Is Say "Just Maybe..."
Just maybe this is the solution you've been waiting for. I don't know for sure, because I don't know you. That's why I'm providing you with a full money back guarantee for the next 60 days. That's right. The product is only $29.95...and even then it has absolutely no risk. For $29.95, about the price of dinner for two at a low cost restaurant, you can have in your hands the same system used to grow thousands of delicious organic tomatoes. Put this "roadmap to prolific tomatoes" to the test. Try it out. Click the link below to order. You have nothing to lose... and everything to gain. "Yes, I Want The Virtually Foolproof Method of Growing Tomatoes!" P.S. Don’t forget to order now to receive your gardening budget secrets. This even makes this deal that much sweeter! Not only do you save $20 off the eBook, but you get budget busting secrets worth $9.95 FREE! That’s already a savings of $29.95! Order now, because I can’t keep this offer going much longer. I can’t wait to hear from you! P.P.S. Just to make sure you know how much I want you to succeed, I’m including ANOTHER BONUS! You will also receive another gift from me that will get your creative juices flowing, turn your gardens into focal points and conversation pieces. This exciting package will give you phenomenal ideas showing you how to recycle everyday materials into the most creative planters for your flowers and herbs. This is another $9.95 value, and yours to keep…FREE!